Pick and place machines are marvels of modern technology. They the can lift, orient, align and drop tiny electronic components onto a circuit board that is headed for the reflow oven. On an industrial scale they move so fast it’s a blur in front of your eyes, and they use imaging to ensure proper placement. But that kind of specialized equipment is going to cost a real bundle of money. [Bootstrap] is working on a design that will still be feature-rich, but will allow you to purchase your own pick-and-place machine for under $1000. The design calls for a two-headed beast. One head is a vacuum tweezers which is capable of moving the parts. The other is a digital microscope that is used for precise positioning. 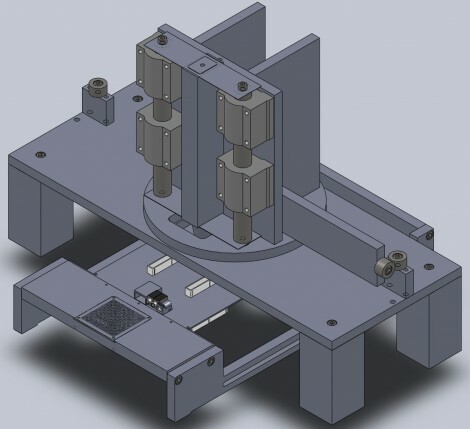 The two heads pivot in and out of place, but it’s the table which holds the PCB that is responsible for positioning the parts. Although there’s nothing built yet, the depth of information that [Bootstrap] published in his post is impressive. He’d like your help making sure there’s no errors in the design before he builds the first three prototypes. If you’re a Solidworks guru he’ll even send you the files upon request. We’ve seen a couple of different pick and place machines lately so take another look if you missed them the first time. I don’t want to be negative, but looking at the guys design its pretty obvious this thing is never going to work at the precision he thinks it will. Do people seriously need a pick and place that badly? i cant imagine the cost of soldering as many devices as a pick and place would require would be much if you outsourced it. In the end i think even if it works the manual drive element of the design wont really save much time anyway. Have you ever looked into outsourcing assembly? stencil setup and other NRE is usually $200 min, then the cheap ones charge $30/brd (< 20 components) with a minimum of 5 – you're looking at a third of the cost of this PnP, just for one board. Granted, your time is assumed free here, which in some cases is not true. Quite simply, if you can avoid outsourcing and get assembly done in house for the super small scale stuff, you're much better off. The "manual drive" bothers me a bit – not having looked at the design at all though. . .
just read some of the post and realized there was no automation at all, this is simply a fully manual pick and place, stating that most of the placement would still be done by hand. I’m not sure how much of a market there is for hand-placed BGA’s, the $1k cost is somehow quite sobering now, knowing that most of the work would still be done “by hand”. how many people would wind up using non hand-place-able components in their designs that are manufactured in-house? I’m curious now. You can get much much cheaper than that, search a bit more in forums about assembly houses, or give a tour that the myropcb services.. I had assumed this was going to be an automatic pick and place. I do find part placement tedious but I do not find accurate placement hard. I am able to place something within 20 um by hand under a stereoscope. If the stencil can be done by hand so can the part placement, if your hands are not stable enough one can use a stencil with the part completely cut out as a simple alignment tool. I’m excited. So why could this manual machine not be turned into an automated one? Some parts of the design are nice, others complete garbage but are easily replaced with known working conditions. I would be very happy to have one that can place larger components, anything that can reduce workload is a wonderful thing. Just think of the possibilities. Unless I am missing something I could slap this on the side of my cnc pcb mill. Add a pneumatic linear actuator that shunts compressed air from a holdown table vacuum. Then an arduino with basic sensory input to control the timing and Tada! Instant desktop assembly line. For prototyping/hobbyists, there surely is a gap in the market for an outfit that would supply *any* SMD/BGA etc chip on a small breakout board with 0.1″ headers. Sure, SparkFun & others do selected popular chips (and good on ’em : ) but if a supplier offered an inexpensive breakout service for *any* chip througout their *whole* catalogue, they might do good niche business. It would only require them to stock a relatively small number of board formats to service a whole range of pinouts, and then either do periodic batch runs to create a stock of each particular component, or perhaps even produce individual component breakouts on demand. Makbe this service could be subsidised by the original chip manufacturers much in the same way that they give out free samples to developers in the hope of future volume sales. $1000 are these US dollars we are talking about? Sa WHEET! That is a really cool video. Nice video. The accurate placement requirement is because the author is trying to place BGA’s and small components. While you, can rely on the surface tension of solder to move really poorly place 1206’s and SOIC, as in the video, you’ll completely miss the pad if you’re off by that much on a 0201, large pin count BGA’s, even small pitch QFP’s. The curious part about the BGA placement is that they normally require X-Ray inspection to determine whether the joints were made reliably (you obviously can’t do a visual inspection on a BGA). I’m not sure what the author’s solution is for the inspection process – you can have continuity and still not have a reliable joint which can withstand mechanical and thermal stresses. This sort of proposal is exactly what I’m curious to hear. Right off the bat, you mention what sounds to be fairly heavy modifications to the machine – so at what point do you just use this design as a reference and do it yourself? Would you really pay $1k for something you’re planning on modifying heavily anyway? Unlike consumer equipment, you could probably buy whatever subset of components you need at around the same price. That’s the idea. Never buy anything that you can build for yourself. Agreed, BGA and to a lesser extent TGA are the work of the devil and are to be avoided if at all possible. I would change my design entirely to avoid BGA. QFP’s can be confirmed by eye like SOIC. Granted the finer pitches make it more difficult, but not impossible like BGA.